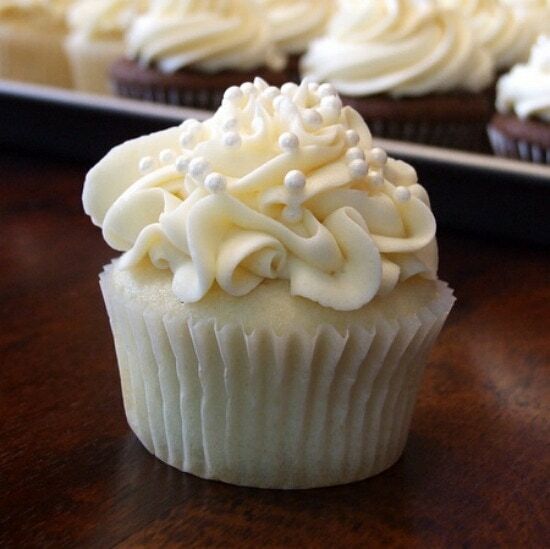 This recipe for White Wedding Cake Cupcakes is one of the most popular recipes on RecipeGirl.com. These are seriously simple to make – you’ll be shocked! But they turn out the best cupcakes. They’re so good! Watch the video showing you how to make White Wedding Cake Cupcakes, then scroll to the very bottom of this post to print out the complete recipe so you can make these at home. What supplies do you need to make Wedding Cupcakes? My suggestion for the cupcake liners is to visit a local baking supply shop where you live. They should carry a good, white liner that won’t have the cupcake turning out greasy. For icing the cupcakes, I recommend trying either the Wilton Open Star 1M tip or the Wilton Closed Star 2D. Both of these you can usually find at craft or baking supply stores. Or just order a whole decorator tip kit and try out different ones! These disposable cupcake boxes are great… because you can bake and decorate your cupcakes, then store them in the boxes and refrigerate them overnight! This White Wedding Cake Cupcakes recipe has been featured in a post on The Recipe Girl blog, with more photographs and information on the decorator tips that were used and which icing recipe is best (Wedding Cupcake Buttercream) and How to Make Wedding Cupcakes. Go there for all of the answers to your questions about details on what tips were used for the frosting etc. I’m not usually one to use a boxed cake mix and doctor it up. I’m much more accustomed to using entirely homemade recipes. 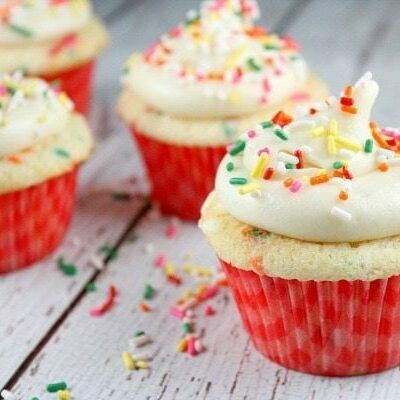 But these turn out delicious, moist and fluffy cupcakes- perfect for holding buttercream frosting. It’s crazy, but it’s true! As you can see from the photo, the cupcakes lay pretty flat on top and don’t rise into a mound like some cupcakes. This is a good thing, actually. You want those cupcakes to have a flat layer so there is a nice, flat base for piping frosting on top. Don’t fret if the tops of the cupcakes appear to be slightly moist. That’s okay! Just cover them with your buttercream frosting, and all will be fine. 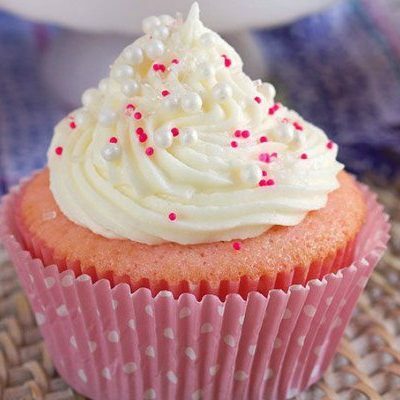 For best results, look for white cupcake papers from a real baking supply store. They’ll have the best products, and that is where I buy the papers that I use. This recipe has been pinned more than one million times by RecipeGirl readers, and the recipe has been made by thousands and thousands of people. I receive so many happy emails from brides who chose to use this recipe for their wedding. It’s that good! Can you bake a cake with the White Wedding Cake Cupcakes Recipe? Yes! This recipe can also be used to make wedding cake. I made cupcakes for the wedding- plus a mini cake for the bride and groom to take home and keep. I used the same Wedding Cupcake Buttercream for the cake too. It pipes beautifully! See the links below for the Wedding Cake and Wedding Cupcake Buttercream links! I’ve made larger cakes by doubling the recipe, and I’ve made mini cakes– as pictured. As with using any recipe for an important occasion, my best advice is to test this recipe out and see how you like it before you make it for the big day. Frost the cupcakes and everything! Then you’ll know if this recipe is for you. 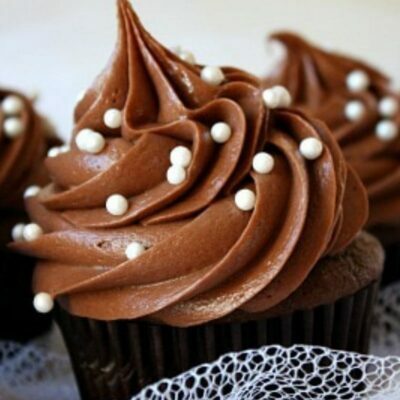 This cupcake recipe is a very popular one. They come out perfect every time, and they are great for special occasions! Preheat oven to 325°F. Place cupcake liners in cupcake pans (you'll need approx. 36). Use an ice cream scoop to fill prepared cupcake tins- fill about 3/4 full. Bake about 18 minutes, or until toothpick inserted in center comes out clean. 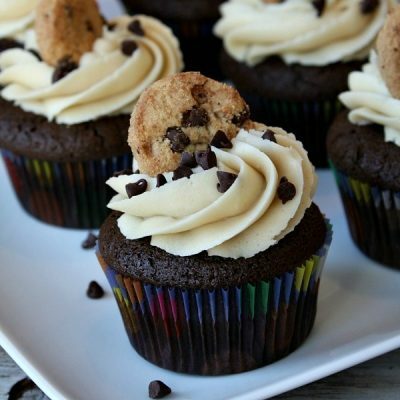 You can use either regular or light sour cream for this recipe, but heck... since it's a wedding cupcake and you want it to be as delicious and moist as possible, I recommend going for the full-fat kind. Add 1 teaspoon of almond extract (in addition to the vanilla) if you wish to have a different flavor. 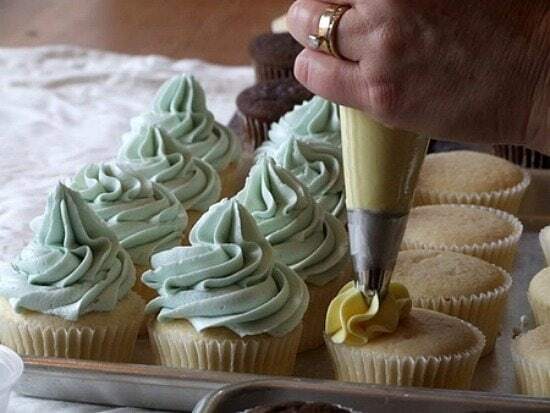 Using a spring ice cream scoop is perfect for getting the batter into the cupcake tins without spilling. You can also use this mix to make cake. Pour into greased and floured cake pans. Bake until toothpick inserted in center comes out clean. I’ve made cupcakes for my daughter’s baby shower as well as for my grandson’s birthday using this recipe. Gets rave reviews every time! Thanks!! Where’s recipe for the frosting? Hi there! Please could you tell us what is in 1 box of white cake mix? I don’t have that option in Zimbabwe. Thanks? I’m afraid I can’t help… you need a box of cake mix for this recipe, and it’s something you can find in the United States. 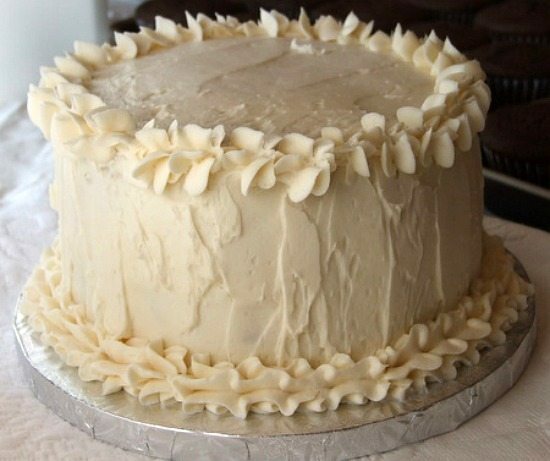 It would be better to find another recipe if you want to make white cake not using a mix. Well, I didn’t read correctly and used the full egg. How does this change the recipe? Should be fine… just won’t be as white.